Posted August 29th, 2012 by michaelkay & filed under Articles. Beverly Hills is one of the safest neighborhoods in entire Los Angeles county, if not United States. 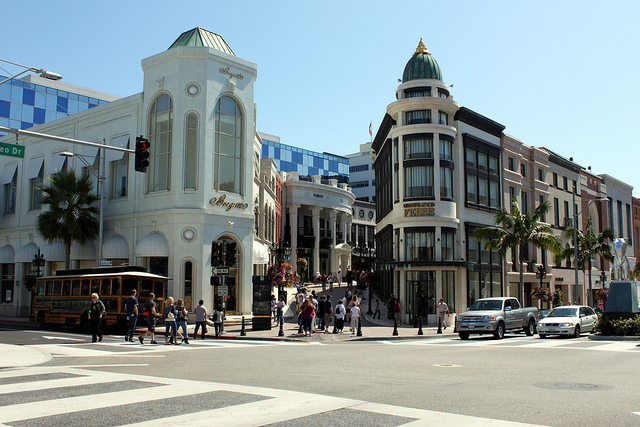 The streets of Beverly Hills play host to celebrities, exotic foreign cars, and the most expensive fashion houses. The city is featured in countless television shows and movies, being portrayed as a concentration of wealth, class,and glam. Because Beverly Hills is regarded with such high standards, the homes and commercial properties that snake their way across the city are just as impressive as any other aspect. Most homes in Beverly Hills are relatively older which can lead to problems related to the foundation of the property, plumbing and other age related issues. Most homes in Beverly Hills are also located on hills and elevated locations. The elevated state of these glamorous homes is a stunning visual effect, however having a home located on a hill can also lead to foundational issues. Foundation issues are the most common issues for hill side properties. One of the main reasons of these foundational issues are ground movements, uneven foundation, and natural decay of the house. Our property inspectors are trained to identify these issues and reflect these issues on their inspection report. In order to ensure that a potential home in Beverly Hills neighborhood is not only beautiful but also safe to live in, we strongly suggest scheduling a property inspection. Schedule a property inspection with any one of our experienced inspectors today. You will be glad to find out the current state of your property. Posted August 19th, 2012 by michaelkay & filed under Property Inspectors. Posted June 23rd, 2012 by michaelkay & filed under Articles. In California, anyone can conduct inspections; no licenses, credentials or certificates required. Ultimately the quality of the inspection will make the difference in identifying the defects or health of your property.There are four main indicators that can tell inspectors apart. Firstly, being involved with organizations that issue certificates to ensure the quality of inspectors. The main associations are CREIA, ASHI, and NACHI. Similar to any other business an E&O insurance reflects the legitimacy of an inspection company. A copy of the insurance declaration can and should be obtained before starting the inspection process. It is important to have unbiased inspectors. Even though, property inspection companies may have large network of contractors and referral lists, it is extremely important that inspection companies do not conduct any repairs. Finally, experience is key to ensure a higher level of success. In property inspection companies a minimum of five years of experience is preferred. 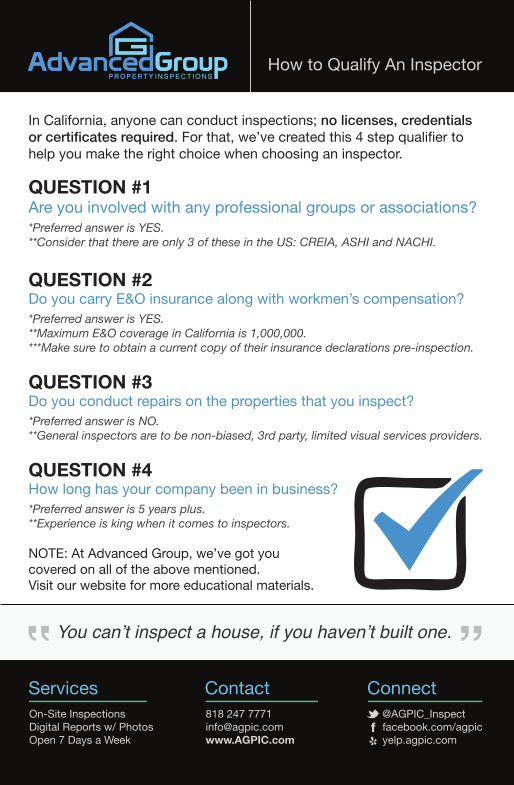 Therefore, we have created this 4 Step Inspector Qualifier to help you make the right choice when choosing an inspector. Posted June 18th, 2012 by michaelkay & filed under Articles. The beautiful city of Pasadena, a lively and diverse city located just ten miles from downtown Los Angeles, is one of Los Angles Counties largest cities and most certainly one with a huge cultural influence in the San Gabriel Valley. The land now famous for the Tournament of Roses, the Rose Bowl , California Institute of Technology (Caltech), NASA’s Jet Propulsion Laboratory (JPL), Pacific Asia Museum and the Norton Simon Museum of Art, Pasadena City College (PCC), and many more attractions. 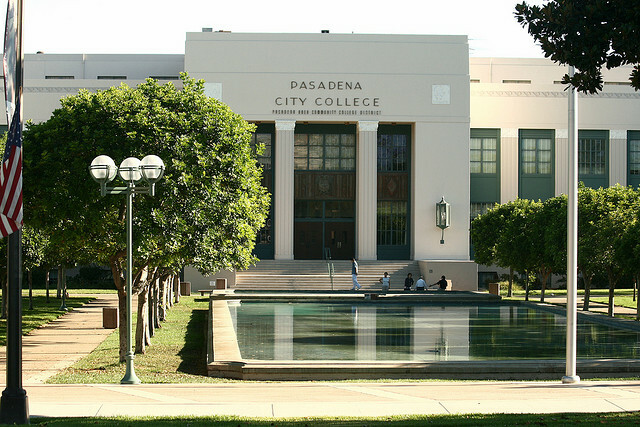 Pasadena is a city of scholars and one of United States Technological forefronts. Old Pasadena is the business district of Pasadena, and as the name suggests, this city is old.Property prices in this area are higher than average Los Angeles neighboring cities, because of the history and culture of the city, and also its geographical location. Since most properties in this city are old, they share very common defects across the city, such as cracked walls due to being close to earthquake fault line, plumbing issues common with old properties, furnace and attic issues. For most common problems and what to look for when doing a visual inspection of a house, check our anatomy section for educational videos, or read our blog post about what to look for when conducting a visual property inspections. To schedule your property inspection please fill our inspection request form and we will get in touch with you within 24hours to accommodate your inspection. Posted June 1st, 2012 by michaelkay & filed under Articles. When buying a home, it’s not just the price of the home you have to consider, but also the price of probable repairs that might come with your new purchase. At Advanced Group Property Inspection, our certified inspectors are trained to inspect your property and find any probable areas of your property that might cause you a major financial cost immediately or in near future, or even areas that might need attention so they won’t cause you a major costs later on. Even though our inspectors are not in the business of repairs, as part of their training, they learn how to estimate costs of major repairs of a property with current market conditions and labor costs, and refer you to the right professional that conducts those repairs for accurate quotes. As a home buyer it is very important to know how much a property would cost to you with cost of repairs included in the final price. Having a property inspection is an invaluable way of knowing critical defects in your property which puts you at an advantage when negotiating with the seller. Even if your intended to purchase property has recently been remodeled, and you think the sellers has taken care of all the renovations and defects, having a property inspection will assure you the piece of mind that all the repairs were done properly and not just a quick fix just to cover up the defects. Posted December 10th, 2011 by michaelkay & filed under Articles. In just his first year as member Lex Angeles receives the prestigious award of “Affiliate of the Year” for the Beverly Hills & Greater Los Angeles Association of Realtors at the Beverly Hills Hilton last week. Lex went above and beyond this year to show support to the realtor members of the association, his fellow affiliates and most of all the West Side Los Angeles community. From hosting educational programs about how to interpret inspections findings to social media workshops aimed to enhance a realtors business Lex was outstanding. Posted December 15th, 2010 by michaelkay & filed under Articles. In just one year after joining the West San Gabriel Valley Board of Realtors, our very own Mary Kay was awarded the Affiliate of the Year for 2010 last Saturday at the Hilton in Alhambra. The award was presented by 2009 recipient April Kass of LaRocca Inspections. It’s been said that the inspection business breeds some of the hardest working affiliates in town. Well, it looks like that statistic just may be fairing true. 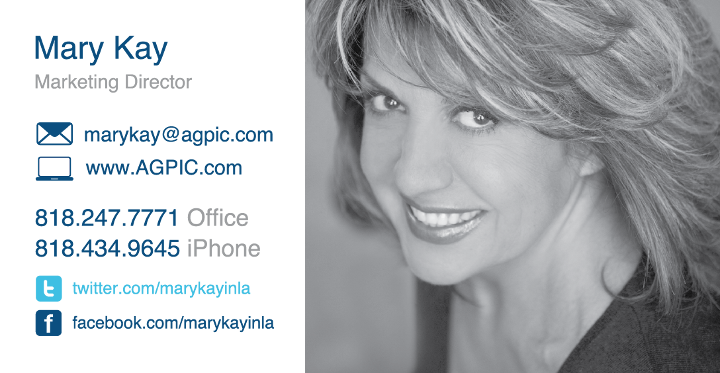 Congratulations to Mary Kay of Advanced Group Property Inspections for all of her hard work in 2010. She earned this recognition through and through. Posted September 10th, 2010 by michaelkay & filed under Articles. So after hiring local design firm Torino Creative to manage our branding efforts in 2008 it was agreed that we update our website once a year. Well today is 1 day shy of 365 since our last update in 2009 – ha. At that time, we included the chat with your inspector functionality our clients unanimously requested in 2007. Since then we’ve helped clarify inspection findings with over 200 curious clients. 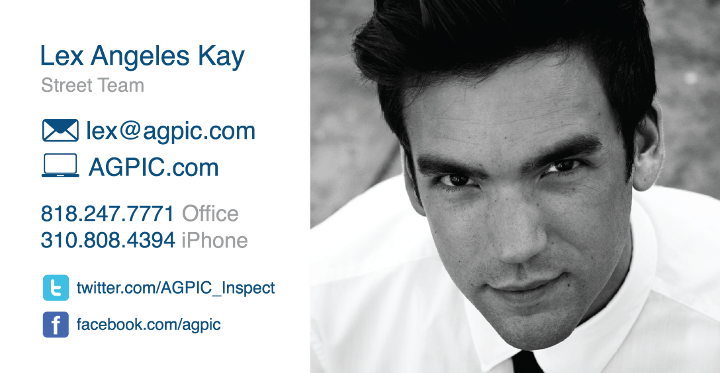 Today we reveal to the real estate world our 12 Step Inspection Anatomy module. It’s a place you can go to learn more about what’s what with your property. We differentiate between common defects and areas of concern in easy to understand day to day vocab – no loaded terminology. Our game plan has always been to help educate the home buying community through a few simple good faith efforts – and that’s what were doing here. Enjoy. Posted April 17th, 2010 by michaelkay & filed under Downloadable Reports. Our company originally started as a commercial inspection company in 1992. Since then, we’ve employed over 50 inspectors, performing 25,000+ inspections with upwards of 1,000,000 pages of reports. See sample commercial inspections below. Posted April 13th, 2010 by michaelkay & filed under Downloadable Reports. Each of our inspections includes a 30 minute on-site verbal walk-through, followed by a full color digital report which includes photos and detailed analysis emailed to your within 24 hours of inspection. 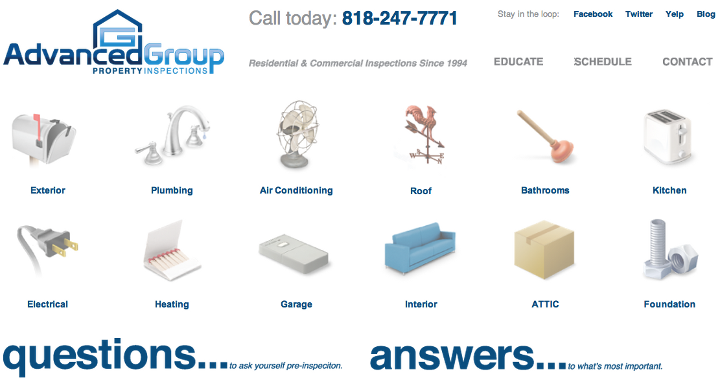 See sample residential inspection reports below.